I can't believe December is here and the year is almost over. 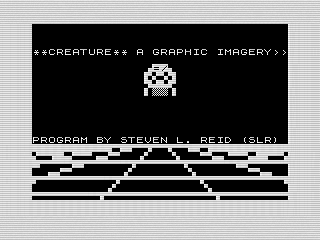 To celebrate the last program of the month, I present Creature, an animation program. Unlike many of the smaller programs submitted throughout the year, this one is the largest weighing in at 14KB. Although Creature isn't as exciting next to more modern computer animations, I still find it interesting to see what could be done with this little machine 26 years ago. Give it a watch, enjoy the nostalgia, and try not to laugh too much. The program itself is complex, cluttered and repetitive. It gets the job done, but not always elegantly. Than again, I was fifteen and using a machine that didn't always lend itself to elegance. As I was typing in the program, I found myself thinking about how to improve it. For example, when I shoot the letters from the U.F.O., I should have reversed the print and erase to avoid the double characters being displayed. I probably could have found a better way to add delay between animations. Even better, I wondered if I could have created a generic sprite rendering system. At least I did reuse some of the animations. If you remember my Beo One program, you'll find a similar speech animation here. I used a variable fed to a subroutine to display the spoken text throughout the animation. I was actually surprised that I'd added eye blink in addition to the mouth movement. This made the floating head look a bit more real. However, I kept thinking that I should have toned down the frequency of blinks. Overall, the effect works well considering the head isn't a human likeness. I was really attempting to add depth to the animations in this program. Although most of the animation is simple horizontal and vertical movement, I did add rotations, animated sprites, and 3D perspective as objects moved in and out of the background. There are also many nods to classic 80s films like Tron and Star Trek. Can you find them? Obviously, the Dungeon Master reference is from D&D, a favorite game of mine at the time. The mash-up of genres adds to the overall craziness of the animation. I chuckled a bit as I watched this as it reminded me of the various demo and intro programs that were popular on my Amiga. Perhaps I was ahead of my time as I don't remember much of a demo scene for the ZX81. Well this wraps up the official monthly program's for the 30th Anniversary of the ZX81. Having a goal of uploading at least one new program a month was successful, ensuring that at least 12 of my programs are now preserved. However, I still have a large collection of programs to convert. Considering I found several candidates for this months program tells me not to give up yet. This year may be winding down, but I plan on continuing to showcase at least one new program each month. Given the stack of printouts next to me, I won't run of material anytime soon.